Everything's bigger in Russia, including their saints. For example? St. Seraphim of Sarov, the ultimate Russian Orthodox Mystic? He had a bear as a friend. A Russian Brown Bear. Which are bigger and nastier than Grizzlies. As my friend commented on seeing the complete work shown here: "His eyes and stare of compassion here show how he could calm bears." 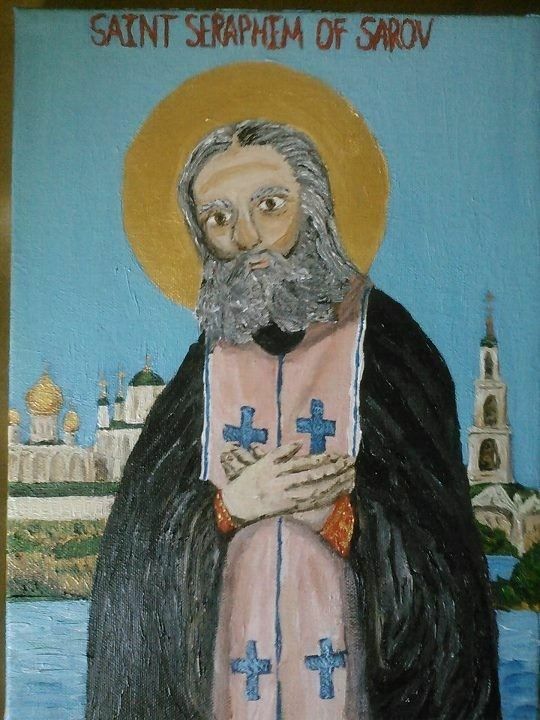 Admittedly, this was an attempt to combine two distinct schools of Iconography in the Orthodox world; the Coptic, with its hyper-surrealism and almost anime/cartoonish style, with the hyper-realism of Russian iconographical traditions. Overall, it's worked pretty well in this piece, I think.